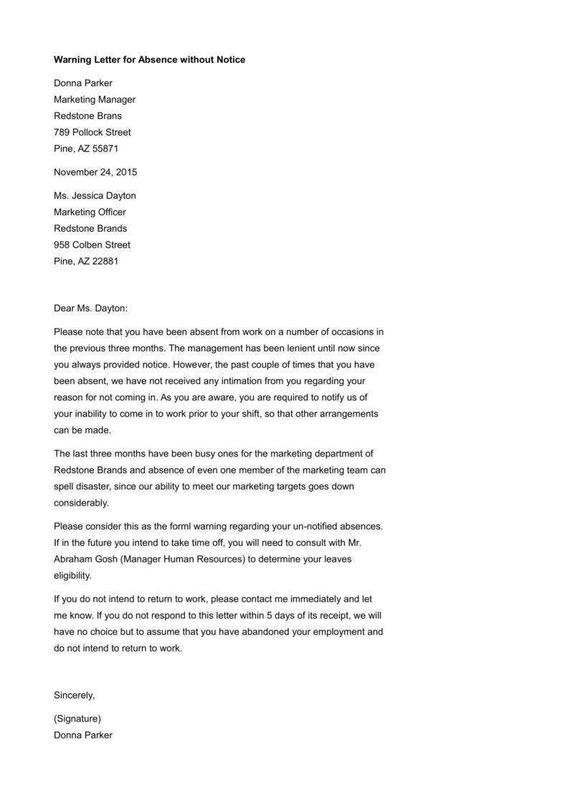 Oftentimes, when an HR manager is faced with a tough decision on an erring or underperforming employee, the best way that he or she can do is to issue a warning letter to the said employee. 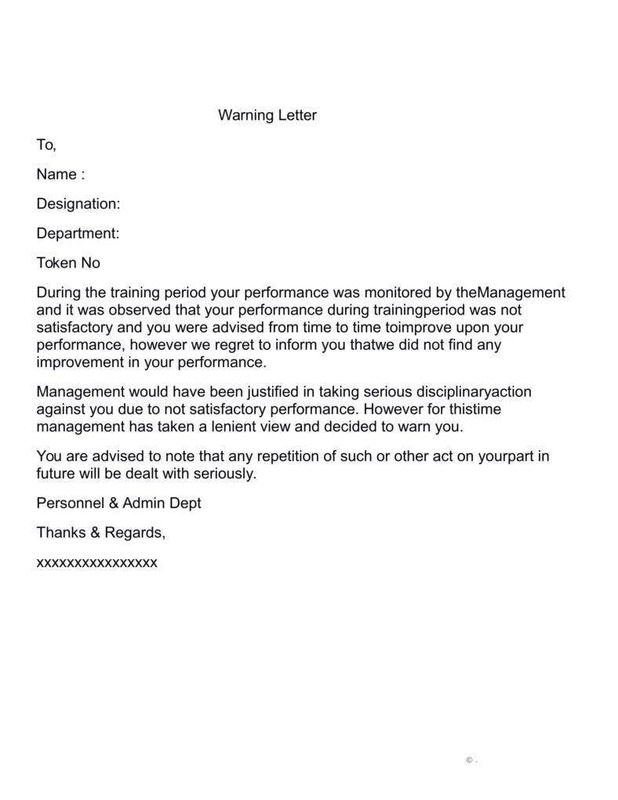 Although it can be an awkward situation to reprimand an employee about his poor conduct or performance, an employee warning letter is a great HR tool that informs the employee about his or her attendance, behavior, performance or other issues that need to be addressed, not only by the employee but also the company. It is important to understand that poor attendance, behavior, and performance can affect the overall well-being of the company, especially its operation and production. While it can be a terrifying to receive a warning letter, there are some instances when the HR manager is forced to issue a written warning letter to an employee due to behavioral and performance issues. 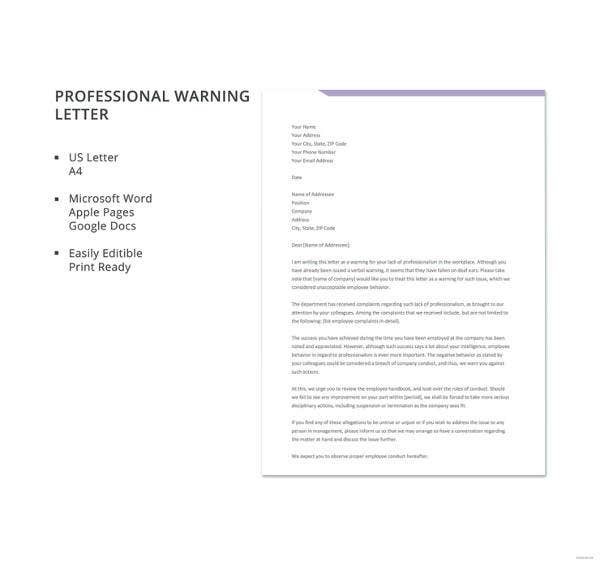 Here are the common reasons why the HR issues a warning letter to the employee. Habitual absenteeism can spell disaster to the level of productivity not only on the employee’s daily quota but also for the business. Once the productivity of the business is affected, it will have a disastrous domino effect that can cause the company to lose sales and profit mainly because the company will not be able to meet the daily demands of their customers and clients. 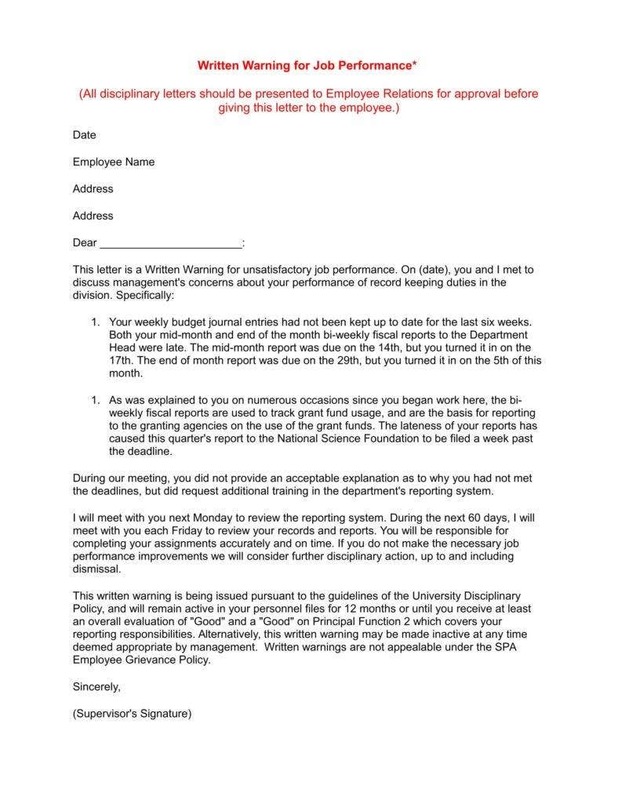 Oftentimes, the HR manager will issue an attendance warning letter to the said employee. Just like absenteeism, tardiness can also have detrimental effects because it also affects the overall productivity of the business. When an employee habitually comes to work late every day, it will be technically difficult for him or her to get their work done. When the employee is part of a team, his or her tardiness can also affect not the team’s productivity but also its morale. 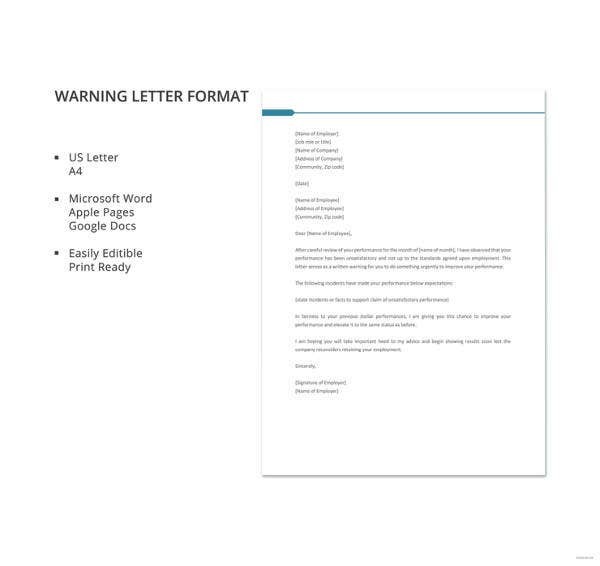 To prevent any further damage, a late warning letter should be given to the employee. No matter what type of company you are managing, there will be some instances of employee misconduct or misbehavior. While in some cases, these can be forgivable, there are occasions when employee misconduct and/or misbehavior is inexcusable. 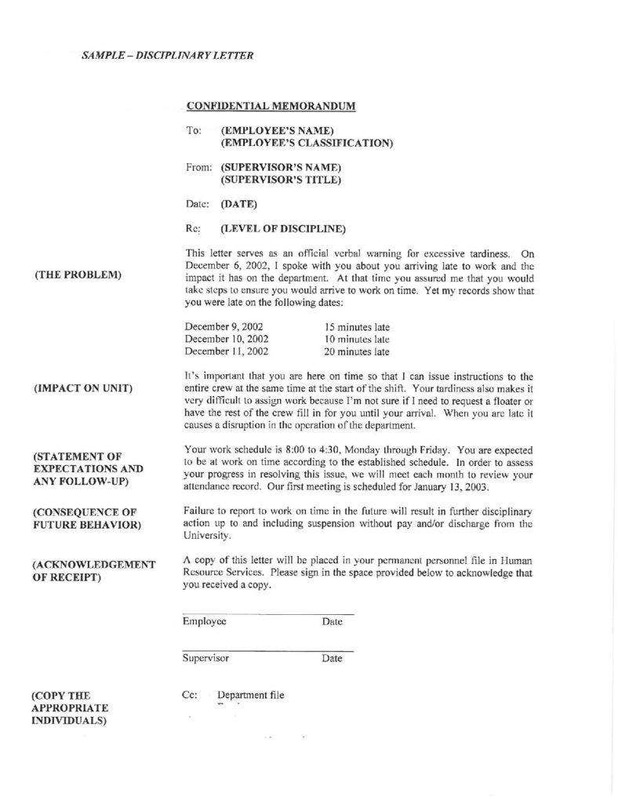 Although the employee may claim it to be just fooling around, as an HR manager, you have to deal with this type of problem quickly and fairly by issuing a behavior warning letter, especially if you can see that it has cause disruption in the workplace. When an employee has a poor performance issue, he or she often fails to perform the duties and responsibilities that are expected of him or her. A lot of times, this negative behavior can have an impact on the people who are working around them. It is important to understand that just like a bad apple, having one underperforming employee is enough to bring down the entire productivity of the team by 30 to 40 percent, according to “The Wall Street Journal” report that was published in March 2013. 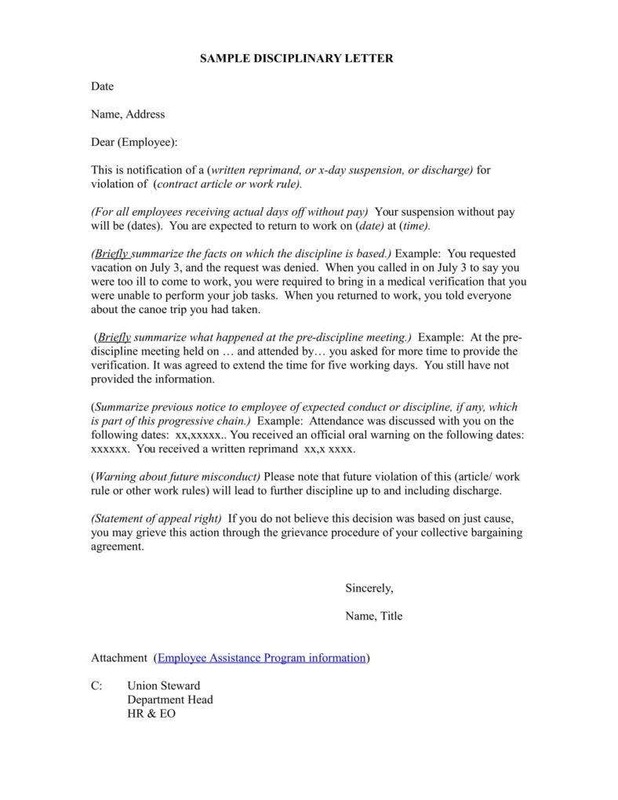 While there can be various reasons behind this problem, issuing a performance warning letter can help you better understand the employee and provide him or her with the proper corrective action to set the employee back on the right track. Oftentimes, when a company is operating a construction or manufacturing business, there are specific standards that they must follow at all times. These standards often protect the safety of their employees from health risks and hazards. So if you are tasked to inspect whether they have been adhering to the safety protocol and discovered that the company has failed to observe and implement these standards, then a safety warning letter should be issued to them. However, not only the company can receive a safety warning letter, but also the employee if they fail to follow the proper attire and gear whenever they are in the construction premises. It is important to understand that all employees, even the good ones, are not perfect. There are times when they are slacking, feeling bored or are just having a bad day or week at work. However, firing them will make no difference because, as an HR manager, one of your duties is to help the employee step up their game at work by motivating them to do better. So if ever you encounter a problematic employee, make sure to follow the protocols of warning the employee. The first thing you will need to do is to have a good one-on-one talk with the employee. 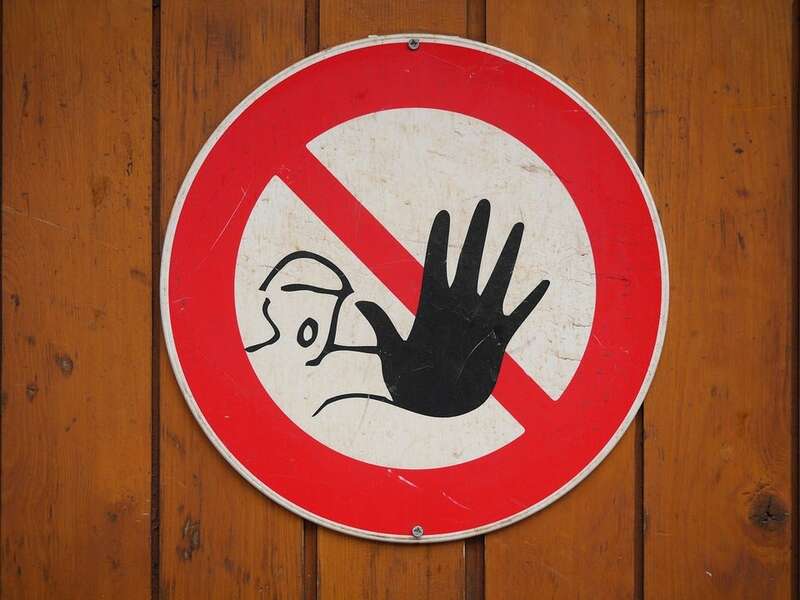 You can give the employee a verbal warning about the issue, complaints, or allegations against him. 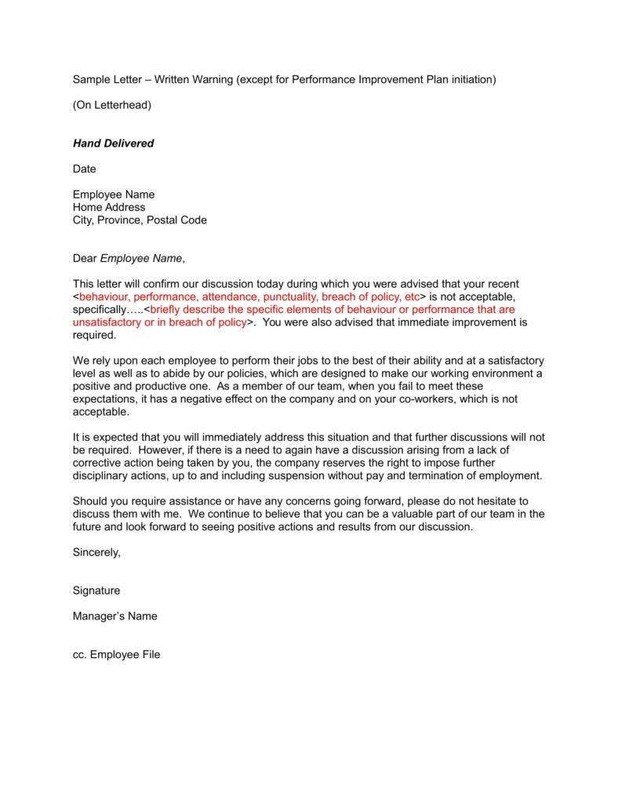 If the said employee fails to address or solve the issue, a first warning letter should be given to him. 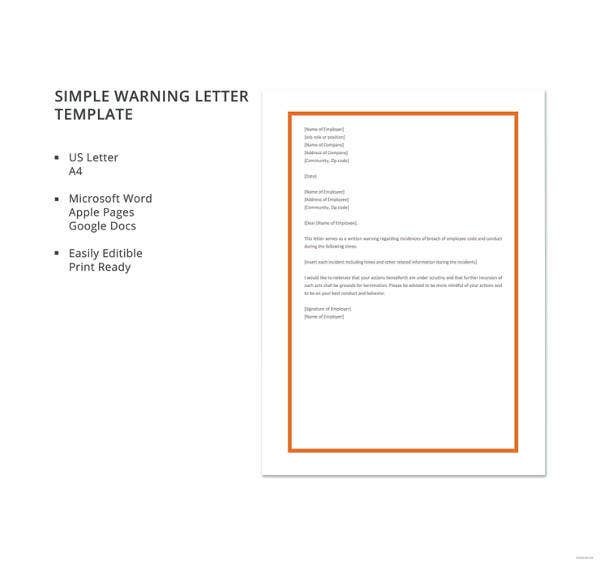 The first warning is often used to signal the employee to change or discontinue any actions that are against the rules and regulation of the company. If the employee continues to neglect the rules and regulations, the HR manager will issue him with a final warning letter that contains the conditions and consequences when the said employee does not comply with the corrective actions. 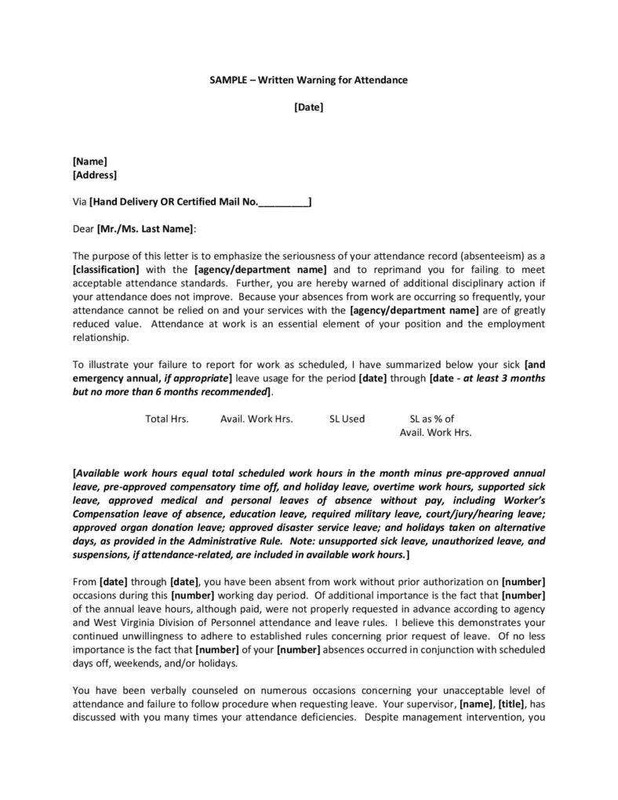 The final warning letter can be a critical factor because it can be the deciding point whether the HR manager should want to continue hiring the services of the employee or should terminate his job contract with the company. 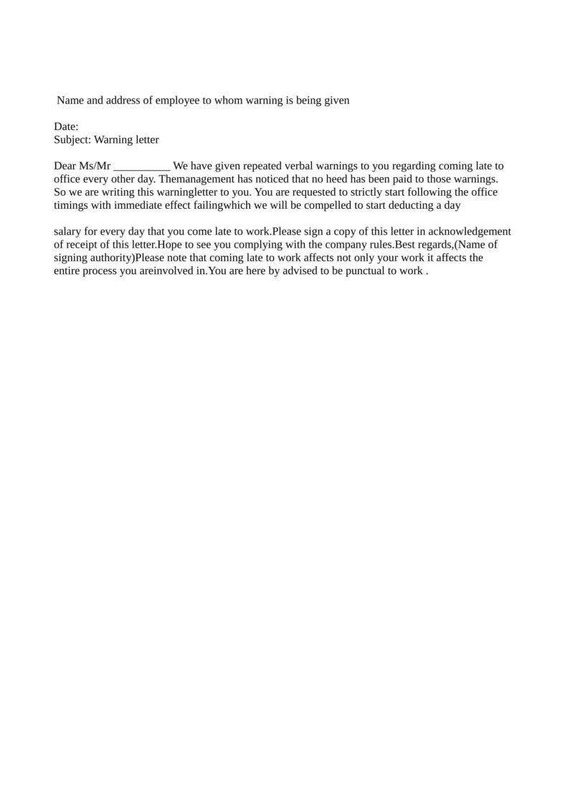 Always keep in mind that it is crucial to come up with a fair and sensible resolution when issuing a warning letter to an employee. However, be firm when warning them that you will not tolerate any actions that are against the company’s rules and regulations while maintaining a tone of professionalism. 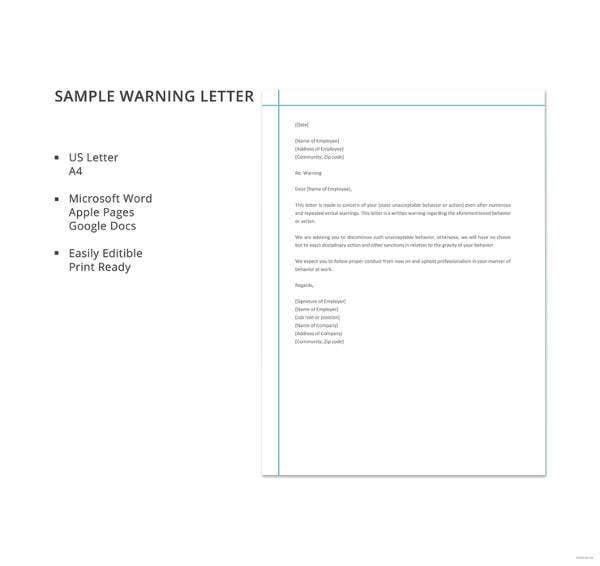 You may also want to check out our warning notice templates before you leave this article.